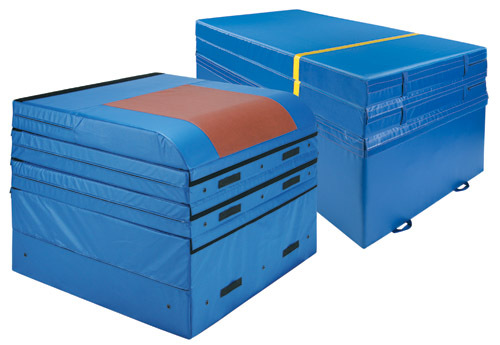 Three-piece system consists of one 5' x 10' x 32" pit and two 5' x 10' x 8" mats to provide the required 32", 40" and 48" height setting. Each mat features a permanently attached strip of material 32" from the front edge, eliminating the need for taping and measuring before competition. 8" mats are secured to top of pit using hook and loop connector flaps on ends. A buckle/strap combination is also provided to enable existing 8" mats to be substituted if desired. Because of its compact size, the 32" pit is easy to transport and position. 32" pit filler is prime polyurethane ripple/lattice foam sections. Mats are covered with tough 18 oz. solid vinyl. 8" mats have forgiving polyurethane fillers for “Flatback” landings. 32" pit is available separately for use with your existing 8" mats. Available with a curve top mat option that simulates the curve top of a vault table, and is covered with our performance top basketball like material. Four-piece system consists of one 5' x 5' x 24" pit and three 5' x 5' x 8" mats to provide the required 24", 32", 40" and 48" height settings. Mats are covered with tough 18 oz. solid vinyl with strategically placed grommets for optimal air expulsion. Permanently attached hook and loop connecter flaps for stacking and connecting height options. Available with a curve top mat option that simulates the curve top of a vault table, and is covered with our performance top basketball like material. PLEASE NOTE: The 24” base pit has a higher density top foam section to provide the necessary support for vaulting.